All songs performed and sung by Ofer Golany in Hebrew. Album released on Oct. 9 2005. 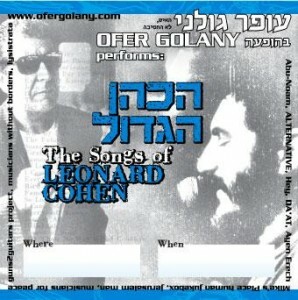 Thanks for featuring הכהן הגדול my Hebrew Leonard Cohen project on the Italian site. Like Leonard i always highlight woman’s voice and it is Netta Amir who sings with me and also plays bass. As an art student she has been to Italy and perhaps will again. Hello Ofer, thanks to you and Netta. Here,some people ask me where to buy your tribute album, please let them know. Love from Italy. Ciao.